Newah Organization of America (NOA) held its successful 17th Annual Convention and General Meeting in Lorton, Virginia on Saturday, May 26, 2018 with more than 200 participants. 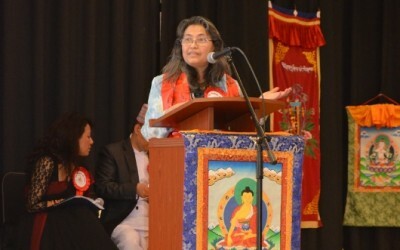 The program was well received by a cross-section of the Newah and Nepalese community around from the Washington DC metropolitan area, as well as from Nepal. This year’s convention theme was “Empowering Woman through Entrepreneurship ”. The program started with traditional music of Dhimay & Bhusya Baja played by NOA Executive Member Mr. Yagya Man Shakya, NOA Secretary Mr. Divakar Dhaubhadel and Ms. Lochani Tara Shakya, a warm welcome by the beautiful Pancha Kanyas: Miss Nitisha Karmacharya, Miss Kritisha Karmacharya, Miss Sasha Tuladhar, Miss Prajna Malla, and Miss Roseeta Shrestha. NOA Secretary Mr. Divakar Dhaubhadel and Mrs. Mila Shrestha served as emcees and called the meeting to order then invited in stage Chief Guests H.E. Nepalese Ambassador Dr. Arjun Kumar Karki, Keynote Speaker Newah Entrepreneur and President of The Dwarika’s Hotel Mrs. Ambica Shrestha, Newah Organization of America President Mrs. Babita Shrestha, Guest Speaker World Newah Organization President Mr. Season Shrestha, Guest Speaker Former US Ambassador Mr. Scott DeLisi, and Guest Speaker Newah Scholar & Poet Mrs. Pratishara Sayami to the stage. 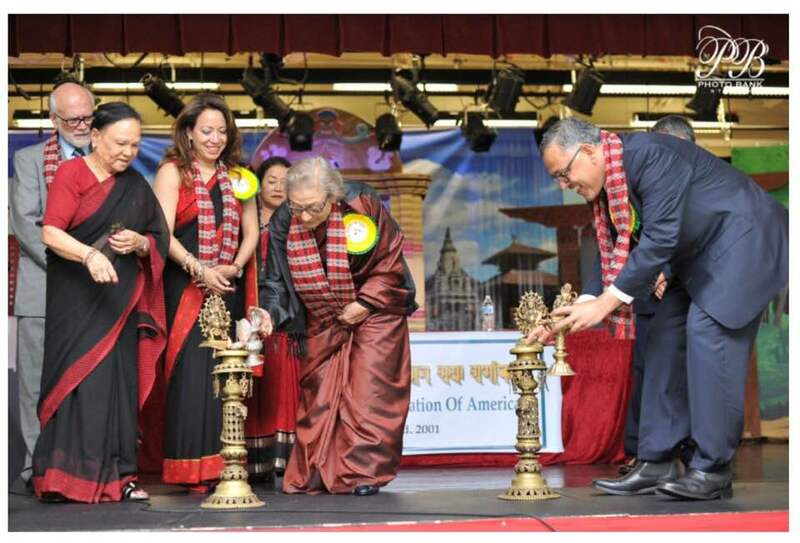 Chief Guest Dr. Karki and & Keynote Speaker Mrs. Shrestha lightened a traditional oil lamp (Twadewa) to inaugurate the 17th NOA Convention & General Meeting, assisted by Mrs. Hari Baba Kayastha and Mrs. Meena Pradhan. All Dignitaries and Guests were welcomed with Badges assisted by Mrs. Chhaya Pradhan & Mrs. Meeli Dhaubhadel and presented Khada assisted by Mrs. Sunita Shrestha & Mrs. Romee Shrestha. The 17th Annual Convention & General meeting began with the United State National Anthem by Ms. Lochani Tara Shakya followed by Nepali National Anthem and Newah Jagaran Song by NOA General Secretary Mr. Mahindra Man Singh Pradhan and NOA Executive Member Mrs. Meena Pradhan. NOA 1st Vice President Mr. Pushkar Prajapati welcomed all guests and organization representatives, attendees for their continued support, and expressing gratitude to the Special Guests and Chief Guests for travelling to join the Convention & General Meeting. NOA General Secretary Mr. Mahindra Man Singh Pradhan has highlighted the annual activities 2017-2018. NOA Treasurer Mr. Rajesh Lal Shrestha has presented the annual financial report. NOA 1st Vice President Mr. Pushkar Prajapati also highlighted on the NOA sponsored scholarship program at Jagat Sunder Bwonekuthi of Nepal. WNO President Mr. Season Shrestha has emphasized the role of NOA towards preserving and promoting Newah Culture in the USA and also shares his experiences of recent visit of WNO convention in Nepal. Guest Speaker Former US Ambassador Mr. Scott DeLisi highlighted the importance of understanding the role of culture & heritage of every communities, also presented a brief introduction & activities of Soarway Foundation, charitable organization helping Nepal. Honorable Key Note Speaker Mrs. Ambica Shrestha has delivered an outstanding speech on convention theme “Empowering Woman through Entrepreneurship ” and she has emphasize to be united to preserve of our language and culture for next generation. 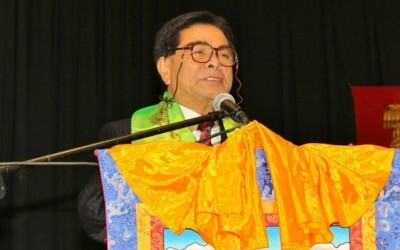 Chief Guest Dr. Karki has congratulated NOA for 17th Annual Convention & General Meeting and expressed appreciation for the role in preserving and promoting Newah culture, heritage and language in United State. Guest Speaker Newah Scholar & Poet Mrs. Pratishara Sayami has highlighted the importance of Newah Language and its preservation for new generation. NOA President Mrs. Babita Shrestha felicitated Key Note Speaker Mrs. Ambica Shrestha with special plaque for her lifetime contribution and research on different aspects of entrepreneurship also takes opportunity to offer Honorary Life Member of NOA. An outstanding service award presented to NOA Founding Members Mr. Balaram Joshi and Mr. Ranta Kajee Shakya for their continuous support and dedication towards NOA. Newah Organization of America magazine “LASKUS 2018” officially launched jointly by all dignitaries and guests assisted by Mrs. Mahima Shakya and & Mrs. Romee Shrestha. NOA takes opportunity to felicitated popular artist Mr. Anil Shahi with plaque for his outstanding contribution towards modern music and NOA also takes opportunity to felicitated with Letter of Appreciation certificate to Mr. Mohan Sundar Shrestha for his lifetime contribution toward Nepali music sector. NOA distributed Life membership certificates to all new members and appreciation certificates to individual and business endeavors. President Mrs. Babita Shrestha expressed gratitude to all dignitaries and Guests for coming together to celebrate NOA ‘s 17th Annual Convention & General Meeting 2018. President Shrestha briefly summarized the NOA achievements and recognition received during her tenure and urged all the attendees for their continuous support. NOA Executive Member Mr. Udaya Shrestha thanked the volunteers for their tireless efforts, the participants, speakers, performers, and the all media representatives for their overwhelming support Mr. Bishwa Raj Thapa of eNepalese.com, Mr. Umesh Sharma of DCNepal.com, Mr. & Mrs. Ram C. Kharel of Sagarmatha TV, Mr. Shreejan Tamrakar of Sanosansar Hamrosansar. Clay Oven Restaurant for catering, DJ K&K for the sound system, South County Middle School for the venue, Q&Q Press for printing Laskus, Eknotech for cover and layout design, Classic Diamond for name tags, Air Zone Travel and Aero Nepal Travel for sponsors, Senior Photographer Mr. Rajiv Shrestha for capturing the moment, Mr. Yagya Man Shakya for stage & videography, and also Mr. Ganesh Lal Kayestha, PK Tax & Accounting, Sagoo.com, Virginia International University, Urban Tandoor Restaurant, Pen Boutique, Namaste Baltimore, Heart 2 Heart Foundation, Mr. Kamal Rajmani Prakash and all other contributors. Also thanked Nepa Pasa Pucha Amerikaye (NPPA) President Mr. & Mrs. Raju Joshee, Baltimore Association of Nepalese in America (BANA) President Mr. & Mrs. Anu Onta, Nepal Education & Culture Center (NECC) President Mr. Khilendra Neupane and all other organization representatives present at the convention. General Secretary Mr. Mahindra Pradhan & Executive Member Mr. Yagya Man Shakya presented a NOA Culture Program 2018, Emcees Mrs. Medina Shakya resumed the cultural program and commenced with popular Newah jhi Newah he juya Newah group song by NOA EC Members. Show warmed up with mix-classical dance by Ms. Lochani Tara Shakya and Ms. Shriya Shrestha-Menon followed by Instrumental presentation of Ukulele by NOALC students Mr. Deven Ratna Tuladhar, a beautiful folk Newari Song Dance by Ms. Mala Pradhan, choreographed by Mrs. Mila Shrestha and vibrant Nepali dance presentation by talented Ms. Nittisha Chaudhary, Ms. Binisha Adhikari, Ms. Sudhatri Sharma, Ms. Tejaswi Pandey, Ms. Ankita Koirala, Ms. Diya Paudyal, Ms. Swati Gupta, courtesy of Navin KC Dance Center, Virginia. Most awaited Musical Presentation, a show of the day which was thrilled for almost an one hour by “Sultan of String” Mr. Anil Shahi along with renown Sarangi Master Mr. Shyam Nepali and well known generation of Tabala Badak Mr. Nhuchhe Dangol. Culture show followed by another vibrant presentation of Dance by next generation talents Mr. Manindra Pradhan, Mr. Abhi Dhaubhadel, Ms. Lujala Ranjit, Ms. Prisha Shrestha, Ms. Bhibhusa Shrestha, Ms. Megha Joshi, Ms. Roseeta Shrestha, Mr. Bidwottan Mohan Ranjit, Mr. Alex Shrestha, and Mr. Aditya Shakya, choreographed by Mrs. Mila Shrestha. NOA one of another memorable Musical Presentation by Legendary Sarod Badak Mr. Mohan Sundar Shrestha with his daughter Mrs. Sharmila Shrestha in Sitar and Mr. Nhuchhe Dangol in Tabala was well received, followed by Newah Song of Melodious voice Mr. Praveen Tamrakar and popular Nepali songs by Mr. Shreejan Tamrakar a lead singer of Okely band. Almost two hours long culture program entertained and closed by upcoming local talented PASA Band with their outstanding performance by Mr. Ashish Bhadel, Mr. Anugh Shrestha, Mr. Prabin Karki & Mr. Sugandha Shrestha. The convention with lively entertainment stretched well into the evening serving delicious Traditional Newah Bhoye (Dinner) followed by distribution of appreciation certificate to all culture & musical participants and program ended with a lot of wonderful new memories.